Someone more taken by swords than Takeda Shingen was his arch rival Uesugi Kenshin (上杉謙信, 1530-1578). He and his adopted nephew Kagekatsu (景勝, 1556-1623) had a famous collection which I have already introduced in volume one of the Legends around the Japanese Swords. The 35 most precious swords are found in the so-called Kagekatsu Kō Ote Erabi Sanjūgo Koshi (景勝公御手選三十五腰) and it is said that the entire collection consisted of 700 excellent blades! One of them was the meibutsu Takemata-Kanemitsu (竹俣兼光) which, among others, I am dealing with in this chapter. According to tradition, it was – for whatever reason – in the possession of a farmer from Oitsu (老津) of Mikawa province who carried it – for whatever reason – with him when he was working in the fields. One day he was surprised by a terrible thunderstorm. He was so scared that he closed his eyes, unsheathed the sword and held it above his head saying the words “May the gods help me!.” And, really, the thunderstorm passed, but when he opened his eyes he saw that the first 30 cm of his sword were bloodstained. He was terrified by the thought that he might have killed the God of Thunder but it turned out that his bag, in which he was carrying the harvested red Azuki beans (小豆), had a hole. From this hole some beans fell out and hit the blade – which poked out of the split scabbard – and coloured it red. Fascinated by the sharpness of the blade he told the whole incident to the villagers of Oitsu. One of them forwarded the incident to the samurai Mikawa no Kami Tomotsuna (竹俣三河守朝綱)*1 who eventually bought the sword from the farmer. Apart from this tradition we find more information on the sword in the Meibutsu Hikae (名物扣) by Hon´ami Kōchū (本阿弥光忠). *2 Therein we read that Takemata Tomotsuna was able to kill with it several enemies at the battles for Anamizu Castle (穴水城) in Noto province. When Uesugi Kenshin heard about its supreme sharpness he put it at the very top of his wish list. Takemata complied with his wish and presented it to Kenshin who gave it the nickname „Takemata-Kanemitsu“. In the third month of Kōji two (弘治, 1557) Shingen proudly wore the sword at the Third Battle of Kawanakajima. In this battle he was in the line of fire of an harquebusier called Mochizuki Heidayū (輪形 月平太夫). He approached him on horseback in a death-defying manner, drew the Takemata-Kanemitsu, and killed him. After the battle the Takeda were clearing the battlefield and they discovered first that Heidayū had two deep cuts under his armour but, secondly, what was more impressing, was that his matchlock (teppō, 鉄砲) was cleanly cut into two halves. Now the Takeda were also in fear of the supreme sharpness of the Takemata-Kanemitsu. Immediately Kagekatsu sent Takemata to Kyōto to clarify the circumstances and mainly to look for the original sword. Together, with the sword official of the Uesugi, they entered the polisher’s workshop in the heart of the capital. “Is it possible that you have sold recently an oversized blade by Bizen Kanemitsu measuring about 90 cm? If that is correct then it has to be retrieved immediately because this sale was a mistake!” After a short discussion in the back of the workshop a messenger was sent and who returned later with an ōdachi. Takemata was able to confirm that this was the real Kanemitsu. As a fraud could not be ruled out the whole incident was forwarded to Ishida Mitsunari, the city magistrate of Kyōto since the first year of Keichō (慶長, 1596). It turned out that an entire gang of thirteen men was behind the fraud. All of them were executed and crucified by Mitsunari at the Hinooka hill (日ノ岡) on the east of Kyōto. The traditions disagree on the smith who did the forgery. One says it was Tanba no Kami Yoshimichi (丹波守吉道) and the others assume it was his brother Etchū no Kami Masatoshi (越中守正俊). The latter approach reports that Masatoshi didn’t know that he was involved in a fraud and that he just made a copy of an ōdachi given to him. Maeda Gen´i (前田玄以, 1539-1602), the then governor of Kyōto, had pity on the smith and managed for his escape along the San´indō main road. When Mitsunari lost at Sekigahara, many of his former judgments were also “invalid” and so Masatoshi was invited back to Kyōto by Gen´i. But there is also another theory which says that the copy was made by the smith Horikawa Kunihiro (堀川国広). As everybody knows, Mitsunari was on the side of the Toyotomi and, before Sekigahara, he tried to win as many daimyō as possible for his cause. 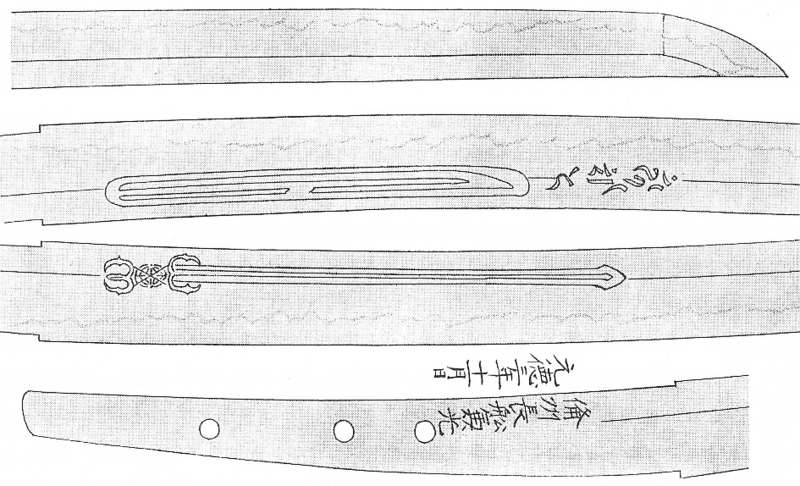 He ordered Kunihiro to go to his castle in Sawayama (佐和山城), Ōmi province, so that he could make several copies of famous master blades to distribute them as sword presents. *3 It is said that many of the copies were of works by Masamune. Quite like “you make this copy for lord XYZ and this ´Masamune´ goes to the daimyō of Mimasaka” and the like. However, the next owner of the Takemata-Kanemitsu after Kagekatsu was Hideyoshi because it was quite high on his wish list and so the Uesugi were unable to refrain from presenting it to him one day. After the fall of Ōsaka the trace of the sword is lost. Rumours said that a rōnin took it to Izumi, Kawachi or even Iga province. Later, the Tokugawa family even offered a reward of 300 gold coins to whoever found it, without success. Well, there is also the theory that the whole forgery incident goes back to Kagekatsu himself who had ordered a copy for Hideyoshi in order to keep the original blade in his collection. As mentioned, the whereabouts of the sword are unknown, and today we only have two different oshigata by the Hon´ami family to base our examinations on. One of them (see picture below) was published in Hon´ami Kōtoku Oshigata. Therein it is listed as owned by Hideyoshi and with the nagasa 2 shaku 8 sun (~ 84.8 cm). We see a bōhi on both sides, bonji, and the carving of a sankozuka-ken in relief at the bottom of the groove. The tang has three mekugi-ana and the signature reads: “Bishū Osafune Kanemitsu – Enbun gonen rokugatsu-hi” (備州長船 兼光・ 延文五年六月日, “a day in the fifth month of Enbun five ”). Drawing of the Takemata-Kanemitsu from the Hon´ami Kōtoku Oshigata. In Hon´ami Kōetsu´s oshigata collection (see picture below), a completely different drawing is found. The corresponding entry reads: “Takemata, nagasa 2 shaku 5 sun 4 bu (~ 76.9 cm), from the possessions of lord Usami (うさ美).” And the signature reads: “Bishū Osafune Kanemitsu – Gentoku sannen jūichigatsu-hi” (備州長船兼光・ 元徳三年十一月日, “a day in the eleventh month of Genroku three ”). The blade has no continuous hi but a kuichigaiba in relief at the base and a bonji, and on the other side a sankozuka-ken. The tang has three mekugi-ana too but the third one is at a noticeably lower position. The entry “lord Usami” refers to Usami Suruga no Kami Sadamitsu (宇佐美駿河守定満, 1489-1564) who was a retainer of Uesugi Kenshin. The later published Kyōhō Meibutsu Chō lists the Takemata-Kanemitsu with “whereabouts/owner unknown, nagasa 2 shaku 8 sun (~ 84.8 cm),” that means it corresponds at least in terms of length with the information provided by Hon´ami Kōtoku. Drawing of the Takemata-Kanemitsu from the Hon´ami Kōetsu Oshigata. But another theory is going round, namely that after the fall of Ōsaka Castle the Takemata-Kanemitsu went to Satsuma province or even to the remote island of Ryūkyū (琉球), present-day Okinawa. This theory is principally based on the notes of the famous Ōsaka sword dealer Okano Shinjirō (岡野新次郎, around Kansei [寛政, 1789-1801]) who is known for having sold several meibutsu and who is even noted in the Shūko Jisshu. In this brief note he writes about the sword: “It is said that it is on Ryūkyū today, or maybe also in Satsuma.” During the Taishō era (大正, 1912-1926) the Shimazu family (島津), the former daimyō of Satsuma, actually sold a ō-suriage mumei blade by Bizen Kanemitsu measuring 2 shaku 6 sun 5 bu (~ 80.3 cm) which was called Ryūkyū-Kanemitsu (琉球兼光) among the Shimazu. 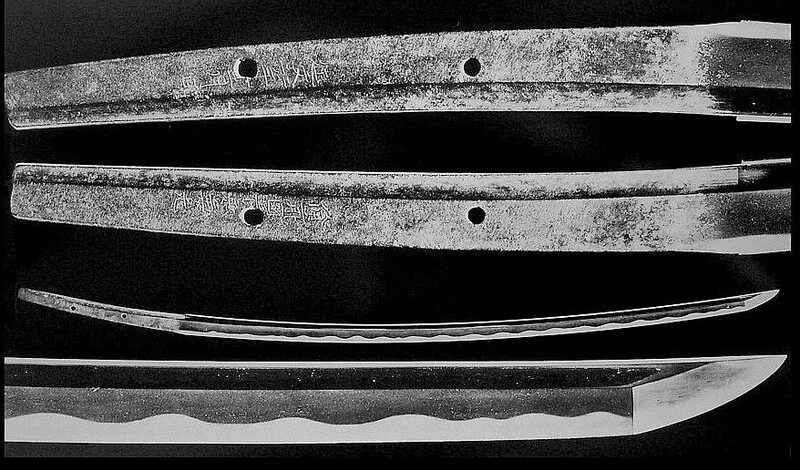 Some say that this blade was the shortened Takemata-Kanemitsu, but it has no grooves or carvings at all and is simply listed in the sword catalogue of the Shimazu as “provenance unknown.” This means that if the family was in the possession of such a famous sword it would have somehow have mentioned it. Maybe this rumour has to be seen in context with another one which says that Toyotomi Hideyori did not commit seppuku when Ōsaka fell but escaped secretly to Ryūkyū via Satsuma. Anyway, in the early 1990´s, the Ryūkyū-Kanemitsu was owned by a certain Fujita Seiichi (藤田整一) from Los Angeles. To present the reader a general idea of the Takemata-Kanemitsu I introduce another ōdachi from the collection of the Uesugi which was made by the same smith and at about the same time (see picture below). It is designated jūyō-bunkazai, has a nagasa of 3 shaku 7 sun (~ 93.2 cm), and is signed “Bizen no Kuni Osafune Kanemitsu – Enbun yonnen jūnigatsu-hi” (備前国長船兼光・延文亖年十二月日, “a day in the twelfth month of Enbun four ”). The incident with the severed teppō lead, and still leads, to confusion with another blade by Kanemitsu which was also owned by the Uesugi family. This other blade is an ō-wakizashi measuring 1 shaku 9 sun 4 bu (~ 58.8 cm) with the nickname Teppōkiri-Kanemitsu (鉄砲切り兼光, “teppō cutter Kanemitsu”). The piece was designated jūyō-bijutsuhin in 1937 but attributed by experts back then to the Kamakura-Ichimonji smith Sukezane (助真). A sword with a nagasa of about 60 cm is unsuitable for a mounted samurai and because Kenshin is known for his preference for oversized ōdachi we can assume that this sword is not the Takemata-Kanemitsu with which he killed Mochizuki Heidayū at the Battle of Kawanakajima. As the Hon´ami family made their drawing of the Takemata-Kanemitsu much later than this battle, it can be ruled out that the blade was the one damaged cutting the teppō and had be shortened to 58,8 cm and was then nicknamed Teppōkiri-Kanemitsu. In short, there existed two blades and both were treasure swords of the Uesugi. Well, there exists the following legend concerning the Teppōkiri-Kanemitsu. It goes back to the work Tōken Hatsubi (刀剣発微), which is a transcription of conversations of the swordsmith Kōda Masatoshi (甲田正利) with master Suishinshi Masahide (水心子正秀). According to that work Kenshin was one night on patrol with a retainer during a severe typhoon. Suddenly they saw a shadow and Kenshin commanded him to show himself. When no one answered he rushed ahead with his sword drawn and cut in the direction he assumed that the person might hide. When the nightguards arrived the scene was examined under the light of wind-protected paper lanterns. On the ground they found a man who was cut in half from the shoulder to the hip and to his side was laying a severed matchlock. Thereupon Kenshin gave the blade the nickname Teppōkiri-Kanemitsu. *1 Another traditions refer to Takemata Mikawa no Kami Yoshitsuna (竹俣三河守慶綱, 1524-1582). *2 When Kōchū was ordered by Tokugawa Yoshimune to compile the Kyōhō Meibutsu Chō he made first a raw version which contained 235 swords. This provisional list was called Meibutsu Hikae. *3 If this tradition is correct then this must have happened between the years 1591 and 1599 because before then Kunihiro was still in his home province of Hyūga, and in 1591 he also worked in Shinano. In 1599 he had settled in Kyōto.